The AOC Agon AG322QC4 aims to upgrade the gaming experience its predecessor provides by adding FreeSync 2 and HDR400 compatibility. This new model offers improvements which bring it closer to the likes of the Samsung C32HG70 when compared to its less attractive AG322QCX sibling. The AOC Agon AG322QC4 is coming to stores in June, so let’s take a peek for gamers who are interested in a big curved screen usually intended for immersive play. 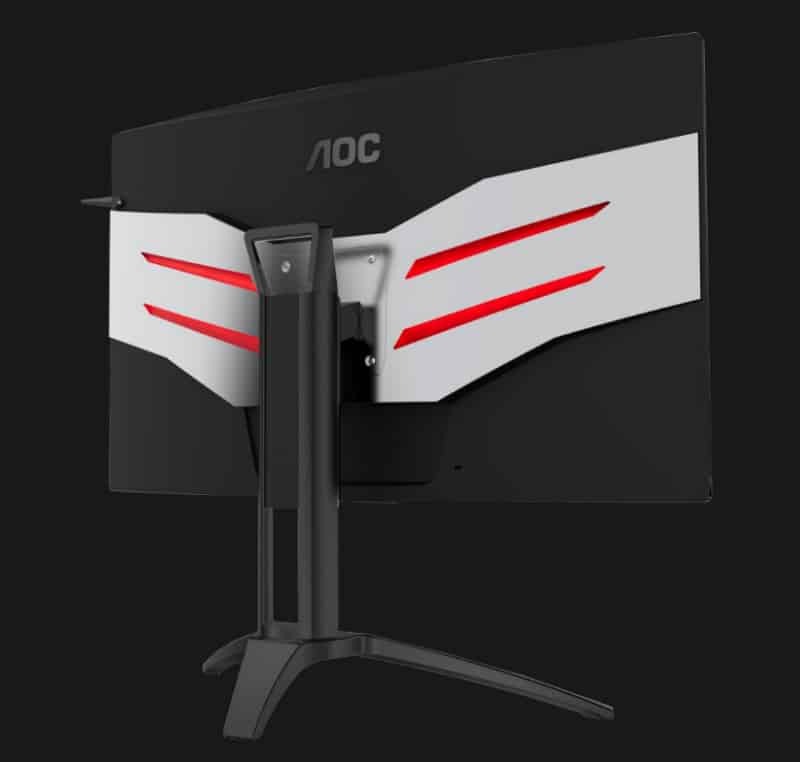 Not a lot has changed for the AOC Agon AG322QC4 externally since it is a refresh of the QCX curved gaming monitor. But this time around, AOC changed the monitor’s bottom bezel to matte black that gives the monitor a cleaner look. The face only has this on the bottom, so the change has drastically improved the appearance since its less striking. The bottom bezel also integrates LED strips which can change from red, green, and blue. It’s a great feature to have especially if you are always fumbling for doodads on your desk in the dark. However, one of our staff members commented that it could become distracting if the brightness of the monitor itself is set to low levels. At the back of the AOC Agon AG322QC4’s chassis, the distinct aluminum wing design is retained. We wished the matte black application stretched to this part so it could match the rest of the monitor. The stripes hide LED lights which can change to red, green, or blue for aesthetics or as a bias light for eye comfort. The borderless design also makes the AOC Agon AG322QC4 ideal for a gigantic triple monitor setup if your budget and computer specs allow it. The screen’s 1800r curve is perfect for enveloping users into the visual experience of games and movies. At this size, we won’t argue that curved monitors are merely a gimmick since they are best experienced with larger screens. Another change the brand applied to the AOC Agon AG322QC4 is that the durable metal stand now comes in matte black. All of our guys agree that the switch to this color treatment is an excellent move since it appears cleaner and meaner than brush metals or glossy surfaces. A complete range of ergonomics save for pivoting is also present, plus you can swap this mechanism out for a VESA option. The I/O layout on the AOC Agon AG322QC4 remains unchanged as well since there is no practical need to upgrade it, although a USB-C slot would have been superb. Users get to choose between two DisplayPort 1.2s, dual HDMI slots, and a VGA legacy connector. There is also a pair of 5-watt speakers which aren’t ideal for the monitor’s primary purpose. All in all, the AOC Agon AG322QC4 felt good and robust due to the material quality and premium craftsmanship. The adjustments are smooth and stiff enough to retain the screen for as long as you need it to. The monitor’s chassis and metal parts feel smooth since there are no uneven seams or burrs. 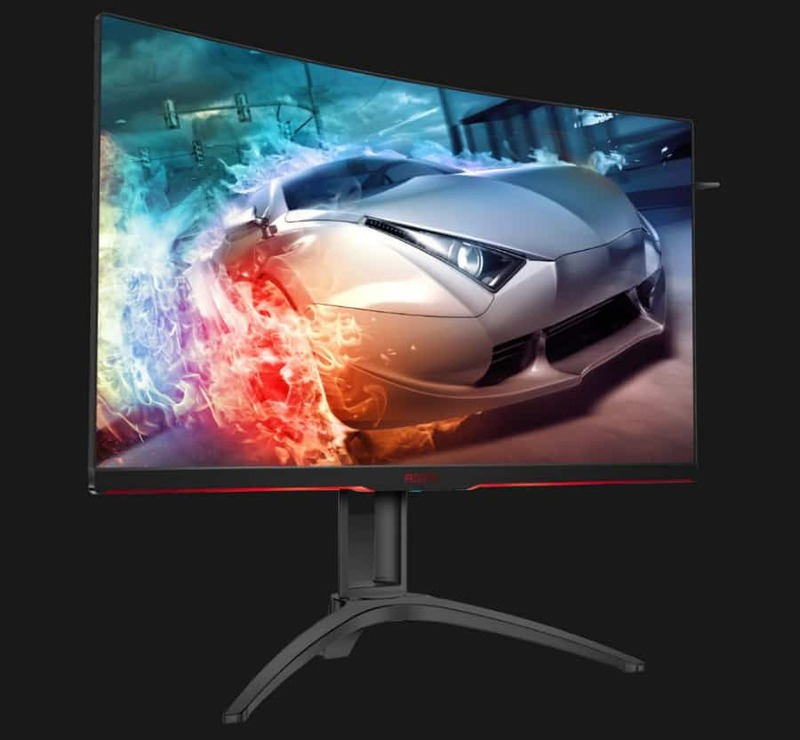 The AOC Agon AG322QC4’s screen is based on a 32-inch curved VA panel from Samsung with a 2560 x 1440 resolution, 144Hz refresh rate, and 4ms response time. AOC specifies this model’s contrast ratio at 2000:1 conservatively, but we know that these panels are capable of higher numbers. Its an interesting fact that the module used, the Samsung LSM315DP01 CELL relies on a customized lighting unit instead of a typical backlight. The results of the AOC Agon AG322QC4’s default setup is impressive, although you have to turn down the 90% brightness to comfortable labels. A colorimeter reveals that the sRGB gamut coverage reaches 120% with a near-perfect accuracy of DeltaE 2.3. The coverage also equates to 89% DCI-P3 which is commendable, but slightly insufficient for true HDR standards. The screen’s gamma can also be left at default since it closely tracks 2.2, except for a minor deviance that only a colorimeter can detect. The AOC Agon AG322QC4 shows good vibrancy and balance, and visibility in varying lighting conditions. The contrast ratio averages at 2600:1 which is excellent, but you can push this score to 2750:1 if you lower brightness to around 50% or less. You can even tighten the color accuracy of the AOC Agon AG322QC4 to DE 0.5 if you have access to a colorimeter. Doing so will also boost the gamut to 123%, but we don’t think the added boost is worth the additional cost. The biggest benefit of calibrating the monitor is correcting its color temp which sits at 7000K by default, although we know most can’t be bothered by the slight error. All of these results translate into a gaming monitor that’s capable of eye-popping vibrancy, black depth, and detail. 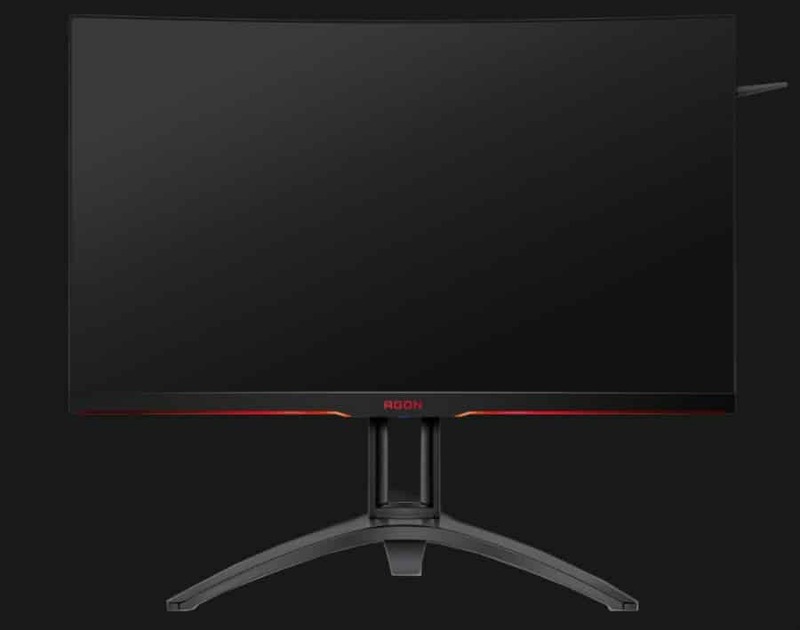 Scenic games like Battlefield V or Ghost Recon Wildlands look engrossing in this monitor, especially since its curve slightly engulfs you. You can even use it for editing or content creation up to some extent unless you need an Adobe RGB-capable variant. It’s also misleading to call the AOC Agon AG322QC4 HDR-compatible since it doesn’t have any unique feature or a complete range of requirements. Only the color coverage of the screen fits the bill, so the only improvement you can see once an HDR signal hits it is the extra vibrancy. It’s also a fact that the backlight which is limited to 370cd/m2 won’t be able to support the dynamic light blooms or effects of the imaging standard. The only glaring flaw we noticed on the AOC Agon AG322QC4 is its panel uniformity which is expected due to the size and curvature. There is a slightly bluish light leak visible from the side which we know will be annoying for the perfectionists. This issue drives the luminance’s deviances to 15%, although when viewed head-on there are no noticeable errors. The AOC Agon AG322QC4 is still a VA panel-equipped monitor so that the slower pixel response time can be expected. The monitor showed blurs at default, especially if you set it to 60Hz. You can, however, solve this issue with the Overdrive feature of the product. The Weak and Medium levels of the AOC Agon AG322QC4’s Overdrive did clear some of the ghosting, but we found that using the Strong level is the best. Almost all of the trails and blurs are entirely gone without any overshoot. We’ve tested several models that had poorly tuned implementations, so seeing something that can pump the fastest setting without penalty is a huge plus. AOC Agon AG322QC4 is a full-fledged premium gaming monitor, so it comes with a Low Input Lag booster in the OSD. The product clocks in at 15ms when Low Input Lag is disabled, but it speeds up to 6ms with it activated. Frankly, we can’t think of a reason why anyone would even leave this valuable tool off since there are no visible differences from the display’s performance. The AOC Agon AG322QC4 is a fantastic gaming monitor which enables it to stand as a huge improvement over its predecessor. The screen’s default and calibrated qualities are phenomenal for this category, while the screen’s responsiveness makes it E-Sports worthy. We also love the redesign that gave it a more aggressive look, although we wish the LED lights were 16m-color RGB capable. The only disappointing aspect of the monitor is its supposed HDR400 compliance which fell through due to some insufficiencies. The backlight did not reach the 400cd/m2 specification, which, we think is crucial to the monitor’s marketing aims. The AOC Agon AG322QC4 is worth the money if you want a monitor with excellent imaging quality, but you may have to look elsewhere if HDR performance is in the list of priorities. What Monitor you prefer: This one or the Benq EX3203R? Hi, Stefan! The AOC AG322QC4 has a slight advantage in image quality, but it’s too little to notice when gaming. The only characteristic which is distinct to each is their aesthetics which caters to tastes differently. I appreciate the review you folks have done. Can you make a recommendation between this monitor and the LG 32gk850f-b? they both seem to fair well and are in the same relative price point. For someone looking for mixed use (with more of a focus on gaming) which one would you recommend? Hi, Osman! The AOC AG322QC4 has a slight advantage in image quality and accuracy, so its the better pick if both are priced the same. Good luck! Got it for £374.99 on Amazon.co.uk . At this price a real steal. Bought it just before Nvidia announced gsync may be avaialble on freesync monitors therefore probably a huge deal at this price. I was more into a 27 inches, but the AOC AG273QCX (comaparable model at lowel size) sells for £599. … So I sent for this 32 inches, that on paper is the very best of what you can want for a gaming monitor: VA panel (if you like picture quality and versatile use for movies…), 144Hzm HDR, Freesync 2 with LFC and Flicker Free…. What else really. Keen to try if gsync works properly on it. and if this is the cas, wow wow wow! Thanks for sharing your valuable feedback, Ben! Good luck with the new monitor! Which one is better this or the Samsung C32HG70? Hi, Hristov! You honestly can’t go wrong with either since both monitors can go toe to toe when it comes to gaming and imaging performance. The only downside for the Samsung C32HG70 is it isn’t flicker-free, but it shouldn’t affect you if you are not sensitive enough.